We offer Vacuum Feed Gaseous Chlorination Plants. The gaseous chlorinators are operated through vacuum, which is created in the ejector because of convergent and divergent nozzle. 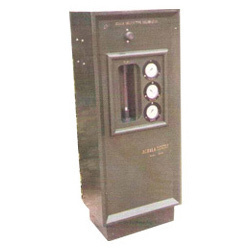 The SM 108 model stand base mounting chlorinator has been designed with a flow meter, gas flow control valve, a vacuum controller chamber, chlorine / water, pressure gauze, a gas filter, a injector to connect motive water, and point of application in order to ensure continuous & constant flow of chlorine / sulfur dioxide or ammonia gas in fully vacuum mode. In sm-108 model the chlorinator is operated under vacuum. The sm 207 model SMPM floor mounting chlorinator is being designed to ensure continuous and constant flow of chlorine/sulpher dioxide or ammonia gas in fully vacuum mode. Precision engineered to provide dimensional accuracy, the floor mounting chlorinator has interesting features like differential vacuum controller chamber, flow meter, gas flow control valve, chlorine / water pressure gauze, vacuum gauze and gas filter, an injector connecting motive water and points of application, etc. SM-207a 1000gms. / hr. To 10,000 gms. / hr. SM-207b 2000gms. / hr. To 20,000 gms. / hr. SM-207c 3000gms. / hr. To 30,000 gms. / hr. If the water supply to the injector fails or meets any block in the vacuum, the inlet valve inside the vacuum regulator assembly immediately isolates the gas under pressure and stops the flow of gas even though the cylinder valve is open and the gas inside the system is exhausted through the vent via relief valve. Our array of Vacuum Operated Pedestal Mounted Chlorinator is developed using corrosive resistant raw material like Teflon, PVC, Borosilicate glass, Silver, UHM, Monel, Hastelloy, S.S.316L and Brass. Pedestal mounted Chlorinator is operated through vacuum. First, the vacuum passes through control valve, flow meter and vacuum regulator and in the regulator; vacuum moves a diaphragm which unseats the inlet valve thereby lowering the chlorine gas from supply pressure. The Vacuum spring and automatic shut-off valve, rugged in design is fitted in the vacuum controller. The failure of valve due mishandling leads to ventilation of gas into atmosphere. We provide a wide range of Vacuum Operated Floor Mounting Chlorinator which is developed using corrosion resistant raw material like UHM, Teflon, Silver, Borosilicate glass, Monel, Hastalloy, SS 316L, Brass and PVC. These are mainly used to flush chlorine with the help of vacuum feed. The vacuum is formed through ejector and it passes through control valve, flow meter and vacuum regulator. In the vacuum regulator, vacuum moves a diaphragm that removes the inlet valve thereby reducing the chlorine gas from supply pressure. Subsequently, the chlorine gas passes through the flow meter, manual rate valve and into differential, pressure regulator. From the regulator, the gas flows to the ejector where the chlorine mixes with water to form chlorine solution, which is carried through the distribution system to the point of application. • It automatically shut off when water supply fails to eject or if there is break in vacuum line. • In chlorinators, the vacuum operations are safely used, as the chlorine pressure is present at only one point. • No mechanical knowledge and training is required in the operation of this equipment, as the chlorinators are simple and can be easily installed. 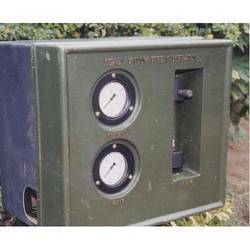 • The chlorine and water gauges are provided to indicate chlorine / water pressure of tonner and motive water line (only in Floor Mounting & Wall Mounting / Pedestal Mounting Chiorinators. • The flow meter is interchangeable in accordance with the different capacity. • The Vacuum spring and automatic shut-off valve, rugged in design is fitted in the vacuum controller. The failure of valve due mishandling leads to ventilation of gas into atmosphere. • Anti-flooding ejectors –differential vacuum regulator. 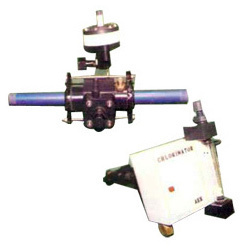 We manufacture Vacuum Operated Direct Cylinder Mounting Chlorinator which are operated with the help of vacuum. 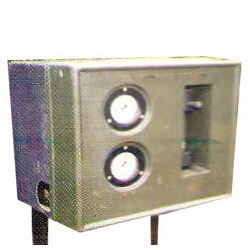 These feature sturdy construction and have an auto shut control that automatically shut off at the time of power failure or breaks in vacuum anti-flooding ejectors. The vacuum is created in the ejector that passes through control valve, flow meter and vacuum regulator that helps in reducing the chlorine gas. Our range is fabricated using optimum quality raw material like Borosilicate glass, UHM, Teflon, Monel, Hastalloy, S.S.316L, Brass, Silver and PVC. In chlorinators, the vacuum operations are safely used, as the chlorine pressure is present at only one point. It can be operated and installed easily. 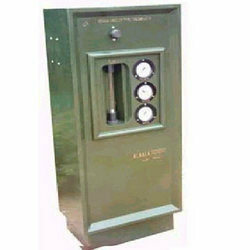 The chlorine and water gauges are provided to indicate chlorine/water pressure of toner and motive water line (only in Floor Mounting & Wall Mounting / Pedestal Mounting Chiorinators. With different capacity, the flow meter can be interchangeable. Auto Shut-Off when Power Fails or break in vacuum anty flooding ejectors, failsafe inlet assemble. Looking for Vacuum Feed Gaseous Chlorination Plants ?